Oxfordshire's Blenheim Palace has recently had their unique collection of historical documents and artefacts transferred to a new, repurposed archive. The move, which was carried out over five days by Blenheim Palace staff, is part of the Estate’s £40m restoration programme which will also see them re-acquiring key lost works. 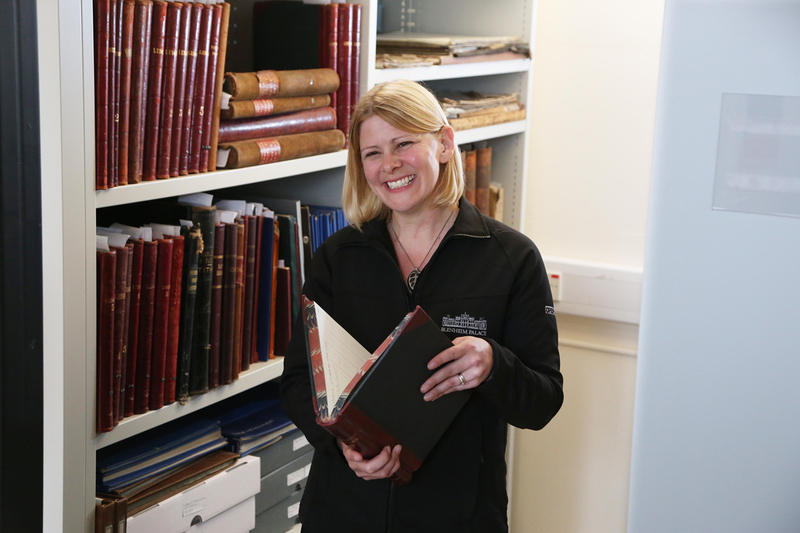 'Correctly preserving archival material is an essential part of protecting Blenheim Palace’s heritage,' said Blenheim Palace archivist Alexa Frost. 'Archives provide evidence of activities which help us to understand the culture of those who lived and worked on the Estates as well as giving us insights into the lives of the Marlborough family,' she added. The new archive features rolling shelving racks to provide ease of access as well as more storage areas for existing material and space to accommodate modern archives in the future. There is also a designated area for map storage. For Oxford graduate Alexa, who also has a Masters degree in Classics from the University of Bristol and is in the final year of a Classics PhD at the Royal Holloway, the new facilities will provide a unique opportunity. 'Approximately 80 per cent of our archival material has been part-catalogued: 20 per cent is yet to be rediscovered,' said Alexa. 'I am particularly interested in the social history of the Blenheim Estates. As the cataloguing programme continues, I often find information about individuals which we were not previously aware of as we have very few records listing individual servants. 'A few of my favourite discoveries thus far include ‘1470 Virgil Aeneid’ – as a Classicist this is a particularly favourite especially as it is an incunabulum i.e. a book printed in the infancy in printing It is in staggeringly good condition and the text is still very legible. 'Also ‘Illuminated addresses from schools etc. to Frances 7th Duchess of Marlborough for her work as Vice-Reine of Ireland 1876 -1880’ – the beauty of the addresses fittingly reflects the kindness of the Duchess and the messages are very touching.' She added. Blenheim Palace is celebrating the 30th anniversary of being awarded World Heritage Site status by the United Nations Educational, Scientific and Cultural Organization (UNESCO). The Oxfordshire palace, which has been home to the Dukes of Marlborough since the early 18th century, is among around 1,000 locations globally to be recognised as having outstanding value to humanity. Designed by Vanbrugh in the Baroque style, the Palace was financed by Queen Anne, on behalf of a grateful nation, following the first Duke’s triumph over the French in the War of the Spanish Succession. Hi! My father was born in the Lodge at Blenheim Palacd and I am trying to find out what my grandfather did on the estate? I am due to visit Woodstock on the 12th February and wonder if there is any chance that I could speak with somebody from Staff Archives for 1916. Family name Moxham and my grandfather was Walter. Many thanks Wendy Cook née Moxham. I am looking for any photo of my 2nd Great Uncle the Rev Frederick John Brown M.A. 1896-1918. Rector of Steeple Aston for 21 years. Rural Dean of Woodstock 1900-1916. Perhaps he had cause to visit Blenheim?